Cyclone is a 3 player, hand /eye coordination SKILL game which challenges the player to win the progressive jackpot!!!! All ticket settings are completely operator adjustable so that percentage payout is possible. This machine comes with the coin mechs and is still on location in Sydney. It is available for quick release. 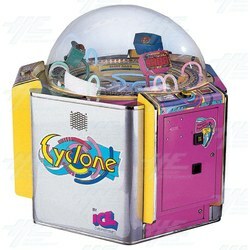 Cyclone is a 3 player, hand /eye coordination SKILL game which challenges the player to win the progressive jackpot!!!! All ticket settings are completely operator adjustable so that percentage payout is possible. This machine comes with the coin mechs and is still on location in Sydney. It is available for quick release.